Cheese, biscuits, alcoholic beverages, desserts and more! Tis’ the season where we see an increase in social outings and overindulging in unhealthy food and beverage choices. Some of us also forgo our commitment to physical activity in exchange for social gatherings. However, the holidays don’t have to test your willpower against your waistline. Staying healthy and fit over this coming holiday season, involves a few simple strategies to ensure you’re prepared for the caloric onslaught. Here are six, positive nutritional tips to help you enjoy this holiday period while staying healthy. Exercise is energising. With days getting hotter and longer, finding time in the morning to exercise can be easier than trying to squeeze in your exercise regime later in the day. Shifting your daily exercise routine to early mornings is particularly important during the holiday season when parties and social obligations make it difficult to find the time to get to your gym after work. Even if you exercise at home in your living room, on your deck or balcony, find the time for some basic stretching or yoga to get your heart rate up. If you are really strapped for time, a few body squats between phone calls at work can really get the blood pumping, the oxygen flowing and help improve your overall health and wellness. The secret to surviving all that fried or sugar drenched food is to never go to a party feeling hungry. Before you head off, try eating a healthy snack. Tuck into a serving of your favourite fat-free yogurt, fruit, or some delightfully crunchy raw nuts. When you arrive at the party, do not charge the buffet table and fill up on those modern party snacks. Wait until you actually feel hungry. Taking food, just to have something to do with your hands is rarely a savvy strategy. However, once you feel hungry, check out the food options for healthier alternatives. Making more mindful choices will help you avoid the dreaded sugar rush syndrome. Opting for well-balanced meals helps you feel fuller and increases your ability to resist the siren song of all that calorie-laden party food. Memo to self, don’t make the mistake of thinking it’s better to compensate for the party calories by eating less during the day. Nothing good can come from that! You can’t attend a party feeling ravenous and expect divine intervention to guide your food choices. Give yourself a fighting chance to keep your food sense on track by eating healthy snacks complemented by well-balanced meals during the day before going out partying. Remember, a healthy, well-balanced meal comprises of a lean protein, fibre-rich carbohydrates and a modest portion of healthy fat. Sipping on that fruity cocktail is not the way to stay sensibly hydrated. The summer holiday season is one time of year when you find yourself drinking more than usual. Not only is all that alcohol not good for your diet, it’s also not good for your system. Moreover, we often experience emotional turmoil this time of year and drinking definitely doesn’t help your mental health. Put on a brave face and limit your drinks. Remember, if you are feeling down our doctors are right here to support you. It’s also common for dehydration to trick you into feeling hungry when you’re not. To understand how much water you should drink each day, take your body weight and divide it in half. The resulting number is how many fluid ounces of water you should be drinking. If you miss a meal, sampling the chocolates your work colleagues brought into the office is almost inevitable. Be sure to start your day by eating a healthy breakfast preferably within an hour or two of waking up. From there, plan to eat something healthy around every four hours after that. If your breakfast is around 8:00 a.m., your lunch should be at noon. Better still; enjoy a small, nutritious snack to get you through the hungry time between breakfast and lunch. Sensible, healthy snacking reduces your risk of over-eating or of binging on junk food at a party. Follow the same strategy to bridge the gap between lunch and dinner. Eating around two hours before bed can ruin your sleep cycle. Your body temperature falls and your metabolism naturally slows when you’re asleep. Allowing sufficient time for your digestion to do its thing before you go to bed reduces your chance of losing sleep from an upset digestive system. The holiday season also sees instances of emotional amping up. Try including some relaxation techniques in your daily schedule to help you manage the increased stress levels that spike every year around this time. Even something as deceptively simple as lighting an aromatherapy burner with lavender essential oils at night can help reset your mood and help you get to sleep. Eating well can be disturbed by the holiday celebrations. 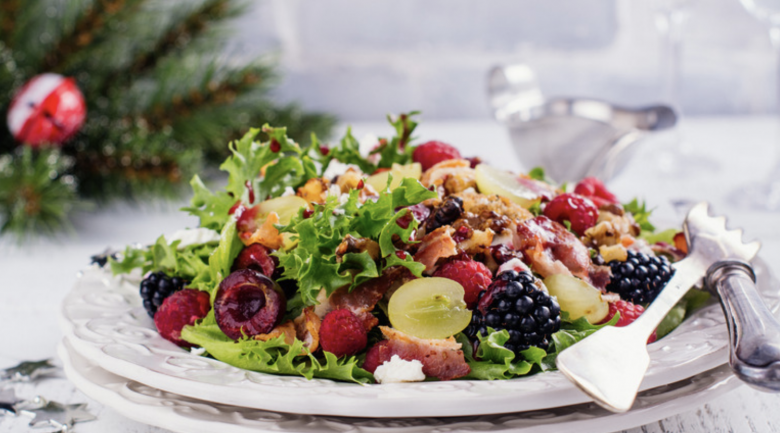 However, these tips can help you make smarter, healthier choices over the holiday season. If you would like further support with nutrition, exercise or emotional support during these holidays, come and see one of our General Practitioners who will work with you to develop some preventive solutions and can provide support to you during the holiday season.